(Seychelles News Agency) - In a boost for the island nation's black parrot population, the Seychelles Islands Foundation (SIF) has confirmed the eradication of the ring-necked parakeet after the invasive species has not been sighted for over a year and a half. 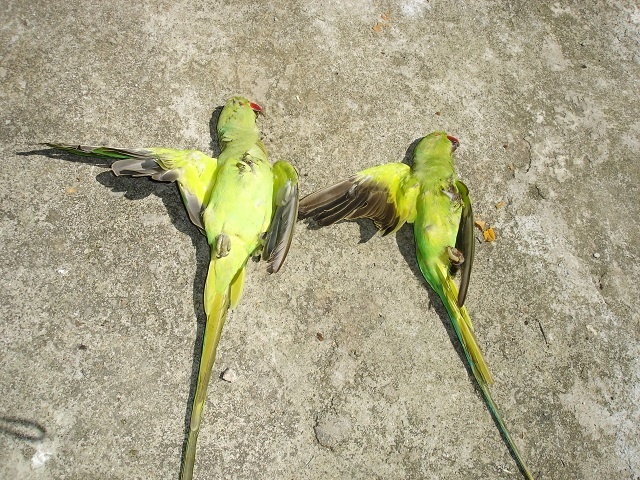 Since the project started in 2011, 500 ring-necked parakeets have been culled. The last known bird was shot in the Morne Blanc region in the west of the main island of Mahe in August 2017. With no evidence of any remaining wild birds during the past 18 months and the final phase of follow-up monitoring completed, the eradication can now be declared successful. SIF said in a press conference on Monday that Seychelles is the first country in the world to eradicate this invasive species. “There are many countries that have tried to eradicate the species. We have also been to quite a number of international conferences where we presented our work and hence know that other countries are trying very hard but haven't been able to eradicate the species,” said Frauke Fleischer-Dogley, SIF’s chief executive. In Seychelles, an archipelago in the western Indian Ocean, the parakeets posed a major threat to the endemic black parrot. Although the ring-necked parakeets were restricted to Mahe, if they had established a population on Praslin, the second-biggest island, the species would probably have aggressively competed with black parrots for food and nesting sites. The species also carries the Psittacine Beak and Feather Disease (PBFD), a disease that affects the plumage and beak of infected parrots. The ring-necked parakeet is one of the most invasive species in the world and the most widely introduced parrot species. It has breeding populations in nearly 40 countries outside of its native range. The species was introduced in Seychelles in the 1980s as caged pets. Five individuals were sighted in the wild in 1997. Following a survey in 2001 at the Jardin du Roi in the southern district of Anse Royale, the ministry of environment counted between 20 to 25 individuals. That was when the eradication project was initiated. The Seychelles Islands Foundation took over the eradication project in with the collaboration of the Ministry of Environment, the Police Force and the Seychelles People’s Defence Force. The support combined with funding from the European Union, the Environment Trust Fund Seychelles, and the Global Environment Facility, ensured the success of the eradication. SIF said that the reintroduction of the ring-necked parakeet into the wild is highly unlikely as there is a ban in Seychelles on the importation on any bird. “If anyone wants to import a bird species, they have to go through the environment department as well as the veterinary office to get the necessary permits. There is a ban on the importation of parrots because of the Beak and Feather Disease. Moreover, most of the parrots Seychellois were importing in the past are now listed as critically endangered under the Convention on International Trade in Endangered Species,” said Ashley Dias, the director of the Biodiversity Conservation Section. SIF has conducted other successful eradication programmes and these include eradicating goats, black rats, feral cats, Madagascar fodies and the sisal plant on Aldabra, one of the UNESCO world heritage sites in Seychelles. Currently, SIF has declared a state of emergency in regards to the eradication of the yellow crazy ants which are threatening the endemic fauna of the Vallee de Mai especially the slugs, snails and caecilians. If these species are taken out, this would affect the pollination of the coco de mer.